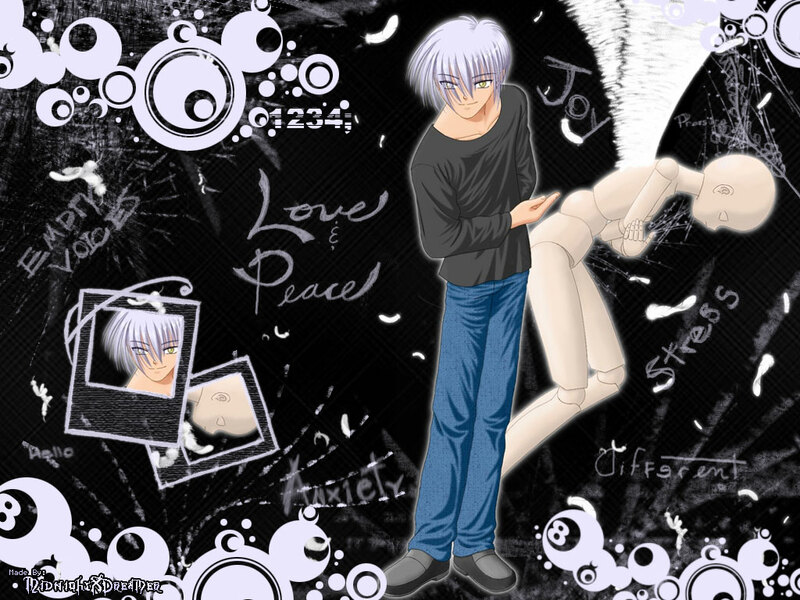 This is a wallpaper featuring Yukito Kunisaki from Air. I used about eleven layers in order to make this layout in photoshop. First, I found an image of Yukito Kunisaki in Google, and then I resize the image since it was too big. Then, I made it into a wallpaper size and painted the new layer black in order to place the image there. I wondered for a while on what decorations to put, but then, I saw the feathers that came from the puppet, so I took a Federn brush and scattered some feathers around the background. Later on, it was just plain so I added a sketchy background layer. For the decorations, I mostly used the Federn brush, the Doodle brush, and the Round Bout brush. I decided to make it like light purplish color like his hair, since I didn't really want a black and white combination. I couldn't come up with the title of this wallpaper until I saw that brush in Doodle that's called "Love & Peace." So I just used that. Very abstract! I like it a lot!